Today, I'm announcing the blog tour for a newly released picture book by Sally Murphy, illustrated by David Murphy, and published by Random House Australia. The picture book is called Snowy's Christmas. 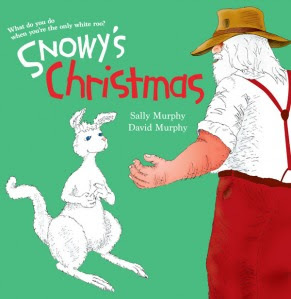 Snowy’s Christmas tells the tale of a young kangaroo who doesn’t like being different, until Christmas arrives and, with it, a surprise for Snowy. There is something that only Snowy can do to help Santa – and suddenly he knows that being different can be a good thing. Available as a hard cover picture book, Snowy’s Christmas is a gentle Christmas story suitable for kids of all ages. You can learn a little more about the book by visiting the website of publisher Random House Australia. Sally Murphy lives in Western Australia and has many roles - author, teacher, mother and book reviewer. She's been writing all her life and Snowy is her twenty ninth published book. David Murphy is Sally's brother in law, but more importantly he has illustrated comics, graphic novels, newspapers, picture books, arts publications, commercial commissions, and fine art pieces. Thank you for visiting my blog. I hope you enjoy the Snowy's Christmas blog tour with Sally Murphy and David Murphy. Plus, the other bits and pieces you'll find on my blog between now and Christmas. Ooh, the festive season is getting scarily close. Maybe soon I'll be able to share some information on the movie my partner and I are working on with a producer and director. Please wish us luck. Welcome to Writing Children's Books with Robyn Opie. Today, I feature a recent interview I did for Trish Puddle's Molly Gumnut blog, at http://trish-mollygumnut.blogspot.com. I hope you enjoy reading the interview. Please email me if you have any questions. And thanks again for visiting. Welcome to my blog Robyn. It’s wonderful that you’ve taken time out from your busy schedule. Could you tell us how old you were when you started writing, and what inspired you to write? Hi Trish. Thanks for having me here. It's a pleasure to visit your blog. I was fifteen when I wrote my first novel. It's my English teacher's fault. He used to give me top marks every time I wrote an essay or a story. You have to love this wise man! One day, he handed me back an assignment and told me, "You should be a writer." I love books and have always been an avid reader but up until this point I hadn't thought about people writing books. My English teacher made me think about it and I went home to write my first novel. Wow! I wish I had a teacher like that, Robyn. I’m sure the readers would love to know about your first published book? And who published it? I had 3 books published at the same time - Jen Stays Inside, People Need Trucks and My Bike. They were published by Barrie Publishing in 1999. I heard about the call for submissions from a writers' group I attend. I already had 30 short children's books written, so I sent them all off. I got 3 accepted, which I thought was a great result. That’s fantastic, Robyn. Tell me, what type of children’s book do you prefer to write? Good ones. LOL. I write for my own pleasure, so I explore subjects that interest me. I enjoy seeing how characters react to situations. Sometimes I put characters into situations I don't want to be in, which gives me a chance to experience the situation from the safety of my laptop. For example, in my book Caught in a Cyclone, I wrote about Cyclone Tracy, which devastated Darwin on Christmas Day in 1974. My book Backstage Betrayal is about a girl who gets locked in an old dark theater overnight. Our Secret Place is based on a true story of a group of boys accidentally burning down an abandoned house. I got to experience these things, as if it was me, as if I was there. But none of these things happened to me. I also love humor in stories. Even my serious books have some humor in them. I believe if I write for myself, for my own fun, then readers will enjoy the books too. I guess it's about being authentic and writing with passion - what you're passionate about. I think it’s amazing that you’ve written and published more than seventy-five books, Robyn. How many hours a day do you write? I usually work on my own stories from about 9am to 1pm every day. Then I take some time out to meditate, relax and visualize my goals. Next, I answer emails and respond to homework from my students. I run a writing for children's course through my website and mentor new writers. The latter part of the day is usually for business type stuff, like submissions, interviews, website maintenance etc. That’s a busy schedule, Robyn. How long does it take you to complete a children’s book? There's no easy answer to this question, Trish. It depends on the length of the book, for starters. I usually write anywhere from 1000 to 2000 words a day. I can write a book of 1000 to 2000 words in a day. Editing will likely take another day or two. Recently, I wrote a non-fiction book of 27,000 words in 14 days. I spent the next 14 days editing it. A novel of around the same length can take me 3 months to write. It depends whether I need to rewrite too. Sometimes I'll return to a novel, after a break to distance myself, and rewrite then edit again. I've been published for 10 years and obviously writing much longer than that. Practice and experience means I can write fairly quickly nowadays. Rewriting and editing is the unknown quantity. But my stories tend to need less editing nowadays too because of all those years of practice and experience. Gosh, that’s a heck of a speed. No wonder you’ve written so many. Are you planning many more books? Hundreds. I'm planning to still be writing when I'm in my eighties. I've submitted a manuscript to 2 publishers. I'm hoping it's the first book in a series. I have another manuscript ready to be submitted. Again, I'm hoping this is the first in a series. Fingers crossed! I have an idea for a book. It's my biggest project to date because it will take some research and education on my behalf to make it convincing and believable. At this stage, I haven't had time to start working on it because my partner and I wrote a screenplay. We've been working with an Australian producer and he managed to get another producer and director interested in making our movie. Right now, we're rewriting to incorporate the director's vision and the actors the director wants for the main roles. It's an interesting learning experience and we're grateful for the opportunity. It's one thing to write about what's in your own head and another to try to write about what's in another person's head. Now that’s something I would love to do, screenplays. That sounds so exciting. Well, I can dream can’t I? Do you have a favorite book that you’ve written? My favorite published book is Black Baron published by Walker Books Australia in May 2008 and Walker Books UK in May 2009. I like this book because it was the first longer novel I wrote. Up until this point, I'd been writing short books for Era Publications. Writing a longer book was a great challenge. I also fell in love with Black Baron. For anyone who doesn't know, Black Baron is a champion racing cockroach. When I started writing the book, Black Baron was going to die. After all, he's a stinking rotten cockroach. As I wrote, I got to know all the characters, including Black Baron. He came alive for me and I fell in love with him. It might seem weird loving a cockroach. I think this is a good example of how writers care about their characters as if they are real. 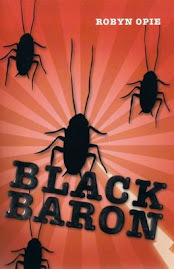 Black Baron is very real to me and I haven't been able to kill a cockroach since I started writing the book. Long live the champ! Yes, as you know, I loved Black Baron too Robyn. I didn’t put it down until I’d finished it. Are there any authors that have inspired your writing? I love reading children's books and most books and writers inspire me. I don't like saying specific names because I know many writers and I don't want to pick favorites and offend anyone. Besides, there are a lot of good books and good writers. It would be a long list and I'd hate to forget any wonderful authors. I can understand that. Do you think you will ever write an adult novel? I started an adult novel once. I spent a day on it. The next day I received an email from Era Publications asking me to write more fiction and non-fiction children's books. By the end of the week, I'd received an email from Walker Books about Black Baron. I got the hint. I decided the Universe was telling me to stop the adult novel and continue with my children's books. I don't think I'll write an adult novel but it's likely I'll write film screenplays for adults. That’s good. More books for kids. Do you prefer writing or teaching? Or both the same? I prefer writing, though teaching is rewarding too. I have to write. I don't know how to do anything else. Writing has become a big part of who I am. I don't think I could teach if I wasn't writing. I need to be creative and I can't let my students have all the fun. I think I'd get jealous if they were writing and I wasn't. I'm not sure I'd be such a good teacher if I wasn't writing. It's my passion for writing that makes me a good teacher. I know what you mean. Writing can be so addictive. I know it gives me a buzz. How do you manage to fit in all the courses, traveling, lectures, school visits and author signings? Sometimes it is hard to fit everything in. Every now and then, I have to take a day off of writing my own stories to catch up on emails and students' homework. I prefer to not do this, of course. I prefer to write every day from 9am to 1pm. But there are times when I get overwhelmed. I use a "Things to Do" list and prioritize what I need to do. This helps. I think you need a clear plan of action when you're busy. During Book Week, when I spend the week doing school visits, I don't have the time or energy to write. I'm glad it's only a week. Naturally, it's hard to write when you're traveling. I do try to answer important emails, though. Wow! What a schedule. Do you ever burn out and need a rest? Yes, I most definitely burn out. I've learned to listen to my body. I used to get sick when I overdid it. I also used to work 7 days a week. Now, I try to rest when I feel the exhaustion hitting. I do my meditation, relaxation and visualization every day. I also take time out on the weekends to do other things and spend time with nature. I've noticed the difference. The good thing about being a writer is that you can read and you're still working. As a screenwriter, I can read screenplays or watch movies and I'm still working. It's brilliant! I know what you mean. It’s a real luxury to sit and read if you're a writer. It’s just finding the time and reading is all part of the learning. It must make you feel good though when you receive great feedback from writers who’ve completed one of your courses, or bought one of your eBooks. You're right, Trish. It's wonderful to be able to help people. I love it. It's rewarding and satisfying. When I receive great feedback, it's a thrill to know I've been able to help and I'm doing a good job. I hope to make a difference for new writers. It's exciting when you get one of your own books accepted by a publisher. It's just as exciting, at least for me, to hear about a new writer getting published and knowing I've helped make it happen. In a way, it's almost more exciting (if that's possible). I received an email from a girl in the 7th grade asking for help on a school project. She didn't know how to start her story, so I sent her a copy of my article on story beginnings - Begin with a Bang - from my website. Yesterday, she emailed me to say thank you, she'd received an A and the teacher was keeping her story as a good example. I was thrilled. If you help people, you never know where it will lead. Anything could happen! 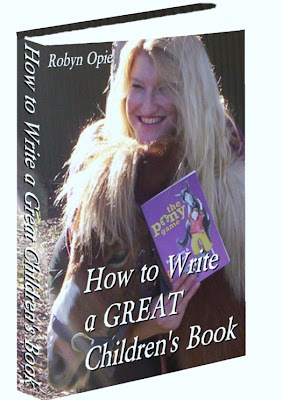 To purchase my eBook on "How to Write a Great Children's Book"
Well you certainly helped me with my questions, Robyn. Thank you so much for taking the time to answer all my questions. I feel quite privileged that you've taken time from your busy schedule to visit my blog. I highly recommend Robyn Opie’s books especially, How to Write a Great Children’s Book and I loved Black Baron and Mr. Fix-It, Not! the best. Thanks for interviewing me, Trish.